An Alien Counts It Fingers. Man: After faster-than-light neutrinos, what next? Maybe intelligent aliens from outer space! Woman: And how many fingers will they have? I guess 10. Man: A thousand dollars says you are wrong. Woman: You're on, and we ask the alien to count them out for us! Narrator: Soon, the first alien visitor arrives; and counts out its fingers, via thought waves, for the Earthlings. Man and woman together: I WIN!! Man and woman together: WHAT??! 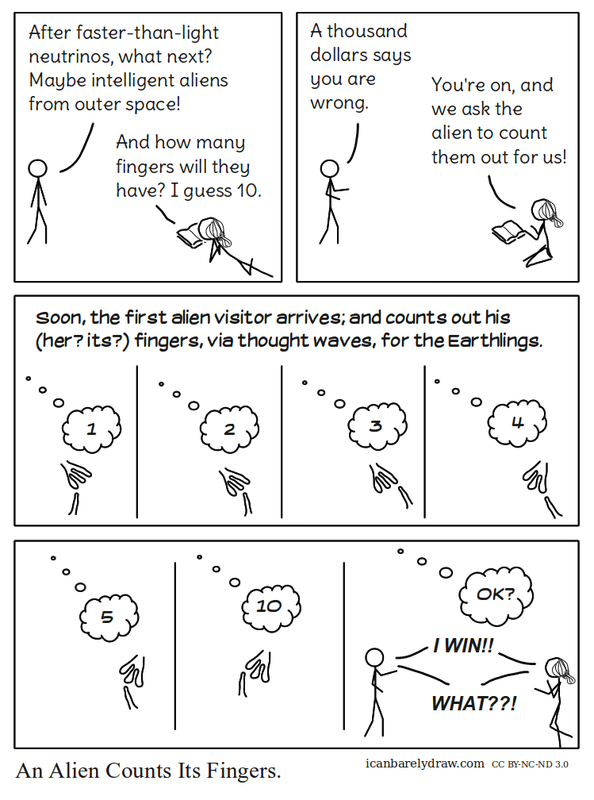 Title: An Alien Counts Its Fingers.